Let's start with some simple herbs, Coriander and Thai Basil, that are both used extensively in Asian cookery, and that can be grown in containers in the kitchen. With its origins in warm climates, it's no surprise that coriander likes the heat - especially the sun on its leaves for a few hours a day. Keep it on a warm window-sill so it has plenty of light and warmth. Grown plants will need to be at least 20 cm apart so bear that in mind when choosing containers. They also need room to grow downwards so the pot should be at least 15 cm deep, and have a layer of gravel in the bottom to ensure good drainage. Seeds take about 2 weeks to germinate and you can begin to harvest the leaves when the plant is 10 cm tall. Harvesting the leaves encourages more growth. To ensure a steady supply, sow seeds every few weeks. If you're sowing outdoors wait until May when the temperature of the soil will have risen. Coriander doesn't like shocks so, if you're sowing it outside, it's best to plant it where you intend it to grow rather than sow it and move it later. Used extensively in Thai cookery, this variety of basil has a spicy liquorice flavour. Thai Basil is a vigorous grower, with plants reaching 90 cm, so they need plenty of room. Like Coriander, Thai Basil loves the sun and will grow well on a light window-sill or in a sunny spot in the garden. In April, use ordinary potting compost over a base of gravel in a large container to sow the seeds. When shoots appear, water from below as Thai Basil doesn't like to get its leaves wet! It can be planted outside from about mid-May. To harvest, break off leaves as required but always from the top, and preferably from just above a growing point - a place on the stem where a new shoot is appearing. This will encourage more leaves to grow. If a flower appears, pinch it out, again to encourage more leaves. Also known as Chinese mustard or mustard cabbage, this is just what it says it is: a mustardy-flavoured cabbage-leaved plant. Young leaves can be used to add a peppery tang to salads, while more mature leaves and stems can be added to stir-fries. Gai Choy prefers a cooler climate and is best sowed in early spring or late summer. The seeds can either be sown in seed trays and transplanted when they're several cms high, or sowed directly into well-prepared earth. The plants will need to be thinned to 15-30 cms apart, and will be ready for harvesting in about 60 days. Gai Choy is an easy-to-grow plant that should thrive if not eaten by slugs or flea beetles, who love its taste! This Chinese cabbage has glossy dark green leaves and beautifully contrasting white stalks, looking a bit like a cross between cabbage and celery! 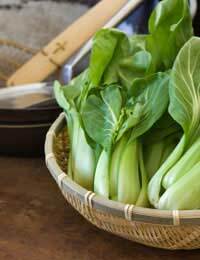 It's used in many Chinese dishes and, like Gai Choy, prefers a mild cooler climate. Best sown in early spring or early autumn in rich, well-drained soil, the plants are ready for harvesting in about 45 days. Both of these brassicas are easy to grow and come in many varieties, each with its own distinctive features. Seeds are available from garden centres, seed specialists and the internet, and more information about planting will be on the packets. We haven't included any advice about feeding or pest control but most plants will benefit from some nutrient-packed food. But if you want to stay organic, choose carefully!